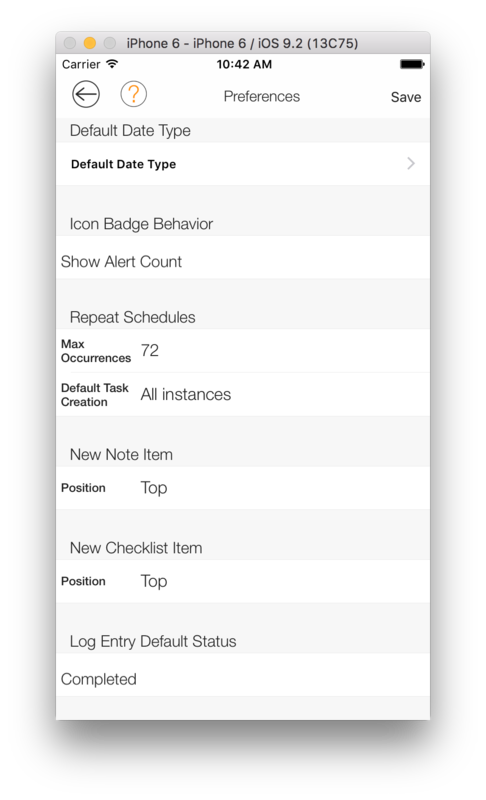 In this view, you can set colors; set maximum occurrences for repeat schedules; position new note items; position new checklist items; set your default search URL; set your Default Dashboard view; enable or disable deletion of quick inbox items after conversion; set whether or not items that are due later in the same day are overdue; set your default iOS calendar, and set the specifications for iOS calendar reminders. Q. What is the App badge icon for? Quick Inbox: Captures and holds any type of information quickly so you can provide more detailed information, such as a due date, later as time permits. Quick Inbox items can be converted to other types of objects, such as tasks or appointments. You can customize the appearance of your app by changing the main color, accent color, top navigation, topic view and graph views. 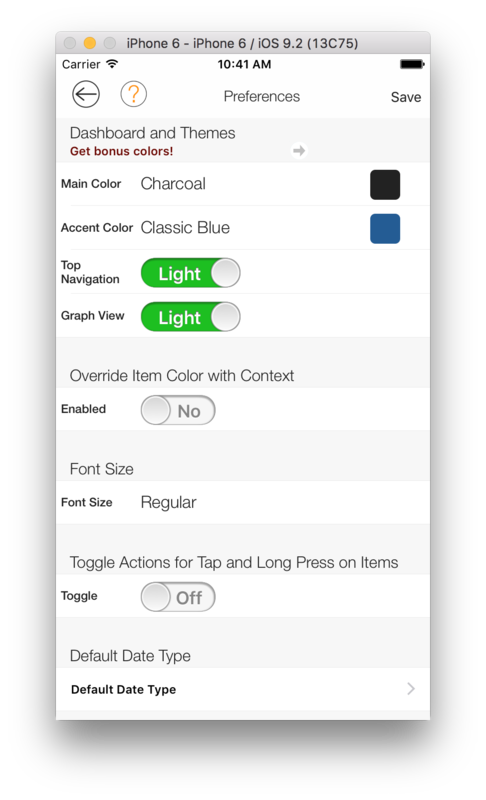 In the My Settings view, tap Main Color and then tap a color. Tap Accent Color, and choose a color by tapping it. In the My Settings view, switch the settings of Top Navigation and/or Left Navigation. This changes the colors of the left navigational pane and title bars from light to dark and vice versa. How to change the colors of the graphs that are displayed in the Health + Goals topic. In the My Settings view, switch the settings of Graph View. This changes the colors of the graph backgrounds from black to white and vice versa. You can also override item colors with the context tag color that you set. For example, if you tagged items as “Exercise” with a red context tag, the Override Item Color with Context option will change all the items that are tagged with Exercise to red. Simply switch it to YES. In your LightArrow app, there are several settings for font size. You can choose from Small, Regular, Large and Extra Large by selecting one of these settings from the Font Size selection in the My Settings view. When tapping items in our app, the cell expands which allows quick access to common functions for items. There is also a “long press gesture” for opening items with fewer taps. For example, from your Agenda view, you can tap and hold any item and it will open it immediately. If you prefer not to use the long touch, you can turn it on and off via Toggle Actions for Tap and Long Press on Items. Simply switch it to OFF. You can specify the default date type (Date+Time or Date Only) for many types of objects. For example, when you create an object, such as a bill payment, you can specify date only to be indicated as opposed to a date and time. The types of objects that support this setting are appointments, bills, events, notes, projects, checklists, inbox items, services, shopping items, shopping lists, trips, tasks, and visitors. In the My Settings view, tap Default Date Type and then tap a type of object. Tap Date + Time or Date Only by tapping your selection. After you’re finished making your selections, tap Save. The badge for the app can show the current date or the alert count. Take note, when you change this option, it might take a few days for the change to occur. In the My Settings view, choose Show Date or Show Alert Count. In some areas of your app, you can set repeat schedules. For example, when you define tasks, bill payments, events, or occasions, you can specify that the item should repeat. The repeat frequency you can select includes daily, weekly, monthly, and yearly. In addition, you can specify the duration of the repeat schedule, which can be a maximum number of occurrences or a specified date. This setting allows you to limit the number of instances of any repeating item to safeguard the performance of the app on your device. For tasks, there are different methods for creation of repeat schedules. You can create all the tasks at once or you can ask the app to only create the next task in a series when the previous task is completed or cancelled. You can set the default behavior in My Settings by using the choices described in “How to set Default Task Creation” below. In the My Settings view, locate the Repeat Schedules section. Select the number of maximum occurrences from the Max Occurrences field, and then tap Save. From the Default Task Creation menu, choose All Instances or Automatically When Needed. You can choose whether new note items are added to the top or the bottom of your notes. By default, they’re added to the top. In the My Settings view, locate the New Note Item section. Select top or bottom, and then tap Save. You can choose whether new checklist items are added to the top or the bottom of your checklists. By default, they’re added to the top. In the My Settings view, locate the New Checklist Item section. When logging items, such as health items, you can set a default status. The choices are Completed, Not Completed and Not Completed, If Future. Choose Not Completed or Not Completed, If Future if you want to schedule activity or other health items and then mark them as completed after you complete them. In the My Settings view, locate the Log Entry Default Status section. Choose Completed, Not Completed or Not Completed, If Future. In My Settings, you can determine the order (Ascending or Descending) of transactions. These transactions are found in the Finances topic when you access an account and view the transactions associated with the account. In the My Settings view, locate the Account Transaction Display Order section. Choose Ascending or Descending from the list. When you add bookmarks to an object, you may find it easier to use a search engine to find your desired URL rather than having to type in the URL yourself. If set, the Search URL specifies the starting page to load when you are using the browser to define a bookmark. In the My Settings view, locate the Adding Bookmarks section. Tap Search URL, and then type the Search URL you wish to use, and then tap Save. You can choose the view that appears when you launch your LightArrow app by changing the default dashboard view. The default dashboard view is the Home (Agenda) view for many LightArrow apps. In the My Settings view, locate the Default Dashboard View section. Select a view from the list, and then tap Save. When you convert Quick Inbox items to LightArrow app items, you can choose if these items remain in the Quick Inbox or if they are removed from the Quick Inbox. By default, items are not removed. In the My Settings view, locate the Delete Quick Inbox Items After Conversion section. Choose YES for the quick inbox items to be removed from the view or choose NO for the quick inbox items to remain in the Quick Inbox. 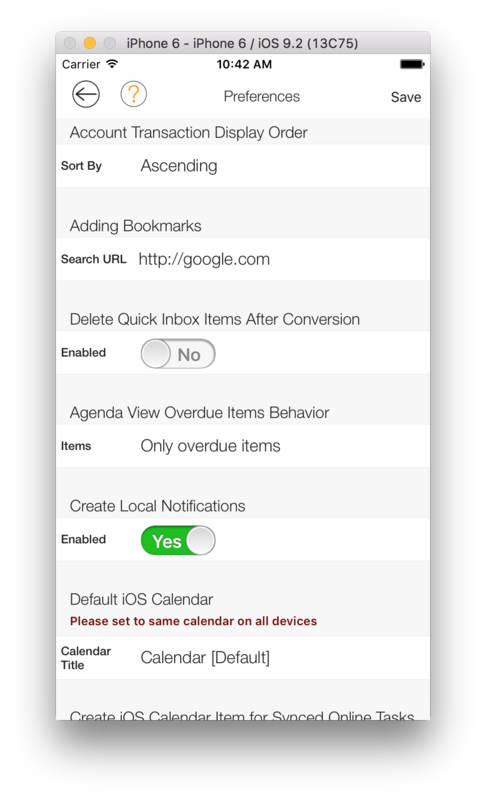 You can choose the behavior of overdue items that show in your Agenda view. You can choose whether overdue items include only overdue items, items due later today, or to exclude items due today. In the My Settings view, locate the Agenda View Overdue Items Behavior section. Choose Only overdue items, Include items due later today, or Exclude items due today, and then tap Save. You can choose whether or not local notifications are created by your LightArrow app. Local notifications originate from the device itself as opposed to somewhere outside the device and they schedule an alert to notify you about events. These notifications are presented as an alert box or notification panel with a message accompanied by a sound and the vibration of the device. When you disable local notifications it does not remove notifications that have already been created. In the My Settings view, locate the Create Local Notifications section. Choose Yes if you wish for your app to create local notifications. When you create a time-relevant item in your LightArrow app (task, trip, bill, event, etc.) — behind the scenes, an entry is made into the iOS Calendar, along with a built-in calendar reminder (this is configurable in the LightArrow app My Settings view). Also, a local notification is registered for the time of the item (for example, the due date/time of a task). Both of those items make a sound, and they respect your configurations in your device’s Settings app. If your iOS device has multiple calendars configured, your LightArrow app can display information from them and make entries in them. This setting allows you to specify which calendar should be the default for entries added when you create date-oriented items in your LightArrow app. Note: If you are using device-to-device sync, this value is not synced across devices. In the My Settings view, locate the Default iOS Calendar section. Tap the field for Calendar Title and choose the calendar you wish to be the default. 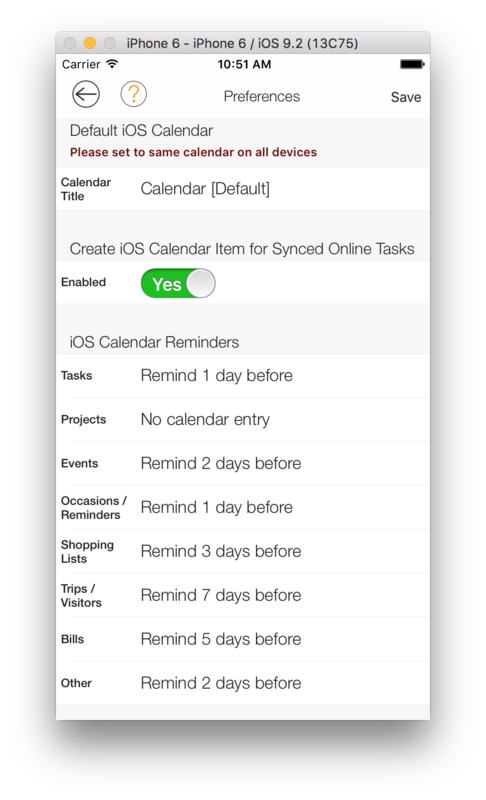 You can choose whether or not to create iOS calendar items for online tasks (tasks from Google, ToodleDo or Asana). In some cases, these apps already create a calendar item; therefore, you might have duplicate tasks in your iOS calendar. Setting this option to NO will avoid this issue if it occurs. Device Calendar reminders make sense for certain objects within your app, and you may want more advance notice for some reminders than for others. For example, you may want to be reminded of your trips five days in advance, but only one hour in advance of each task. You can configure these settings here. When you create date-relevant objects in your app, entries will be added to your device’s Calendar with reminders set according to the preferences you specify here. You can also specify that you want entries added to your device’s Calendar without reminders, or that you don’t want entries added to your device’s Calendar at all. In the My Settings view, locate the iOS Calendar Reminders section. For each of the item types, choose the timing that works for your life or business.